How many of us give a thought to the kind of kitchen sink we buy, or what kind of material it is made up of, and which type is perfect for our cooking space. Kitchen sinks come in a variety of materials, and each one has its own attributes and use. 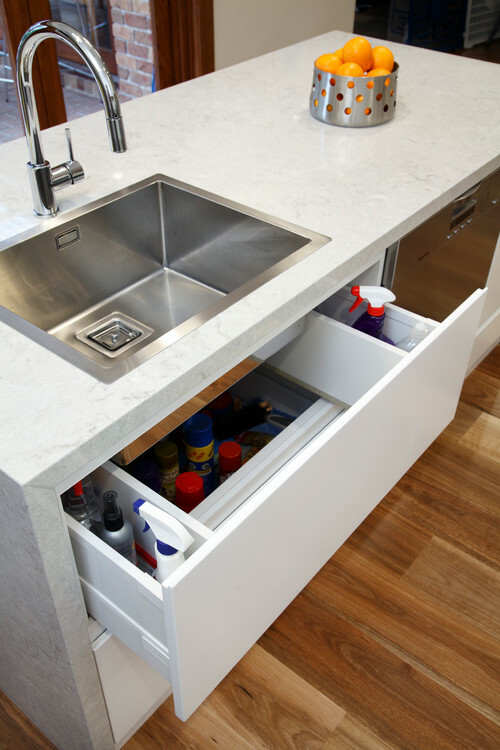 For the majority, kitchen sinks are bought as an accessory along with the rest of the kitchen equipment and fitted into a pre-designated area as a drainage system based on the design and kitchen layout. Many first-time sink shoppers can be overwhelmed with the variety of materials to choose from, and settle for ones that they have heard about or are more familiar with. 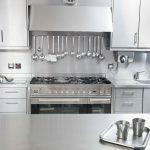 A good insight into different kitchen sink materials can go a long way in choosing the one that’s best suite for your cooking. Among the most popular of sinks, these are used by almost 70% of all homes. They are beautiful, low on maintenance and also cheaper compared to other types of materials. Stainless steel sinks are inexpensive, although designer ones can cost as much as ceramic or stone. Their versatility ensures that they can be installed in a myriad different ways; undermount, top mount, etc. These sinks come in different gauges. Majority of the household kitchen sinks fall between 18 and 20 gauge range. Lower gauge steel is considered heavy while higher gauge is light. Conventional wisdom argues that the heavier gauge sinks are sturdier, but this may not always hold true. It has been observed that the gauge rarely affects the overall quality of the sink. However, heavier gauges are a bit more resistant to denting and have a better shelf life. Stainless steel sinks are noisier compared to other types of materials. These sinks scratch easily, and show water spots more obviously, making it difficult to keep them meticulously clean. Stainless steel is very resistant to heat and staining. These sinks are become increasingly popular and seeing a revival of sorts in modern Indian homes. Jack Healy, of Stone Sinks Online believes this to be a part of the larger design trend towards a rustic and old-world decor style. Believing utilitarian objects to be beautiful, stone epitomizes a great combination of form and functionality. Stone sinks can either be made of soapstone, granite, marble or limestone. These sinks are usually carved out of a single piece of stone, and can either be left in their natural rough state or be made smooth and evenly carved. 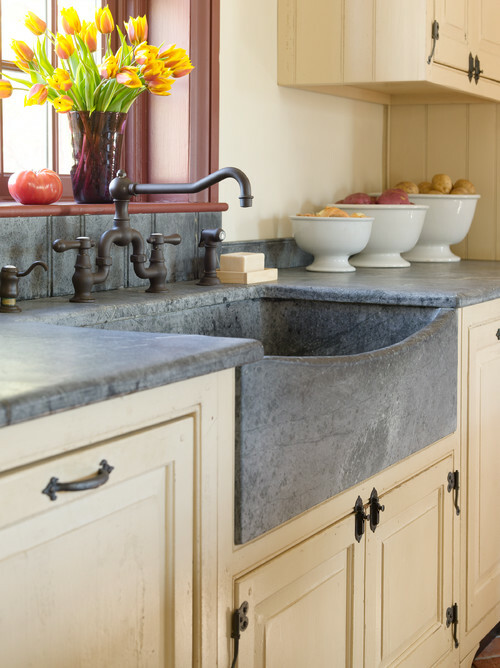 Soapstone and granite sinks don’t stain or etch easily and are also heat resistant. Marble sinks can stain but a good sealer can help prevent the same. Re-sealing has to be done at regular intervals. These sinks are simple, elegant and contemporary. They merge well with both traditional and modern homes. Enamel has been used in kitchens since decades. They are sturdy, long-lasting and can withstand rough usage. They are available in two versions: Enamel or cast iron which is lighter and enamel on steel which is cheaper. These sinks are easier to clean and maintain. They don’t show water spots that easily. Enamel sinks can however chip or crack easily. Composite is a mix of various different materials, mainly granite or quartz combined with a resin filler. 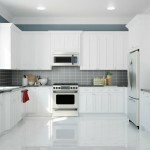 The resultant material has the same features of real granite or quartz but without the associated durability issues. Composite sinks have a beautiful design and finish. 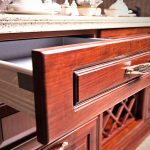 While there are plenty of options to choose from for kitchen sink materials, a kitchen designer will be able to give you greater insights into what works best for your cooking space. Reach out to us at HomeLane for more.